Video cards come equipped with a variety of combinations of external connectors to support a range of monitors and uses. A DB-15 (D-sub VGA) connector is used for standard output to an analog monitor. An S-video output connector is used to connect devices such as TVs and VCRs to the card. A DVI-D (DVI Digital) connector is typically used to connect digital flat-panel LCD monitors. Some graphics cards come with a DVI-I connector to accommodate analog monitors. The digital HDMI and DisplayPort standards are dealt with in the next item. If you want to use a video/graphics card with a HDMI (High Definition Multimedia Interface) output that combines sound and video, you have to cable the digital S/PDIF surround-sound output from the sound card or motherboard into the graphics card to provide HDMI with both sound and picture so as to take advantage of its full capabilities. However, note that if you are only using a 2.1 stereo speakers for the sound output, you will only get two-channel simulated surround sound from them. A 5.1 or 7.1 surround-sound speaker system is required for actual surround sound. Wireless HDMI is available. It is expensive now but the cost will come down and it will no doubt replace cabled HDMI connections, just as Wi-Fi has taken over from wired Ethernet networks. Note that if you want to have HD audio over an HDMI connection, the motherboard chipset or the graphics card must support Protected Audio Path (PAP) that is used to enforce Digital Rights Management (DRM) protection on content. For example, your PC might have a motherboard that has an onboard graphics chip, such as the AMD 780G chipset that handles HDMI output, which was one of the first to support Blu-ray playback that is used for high-definition (HD) movies. However, that chipset does not support PAP, so you would have to install a graphics card in the PC that supports PAP, such as the low-end Sapphire Radeon 5450 (1GB, PCI-E and HDMI, still available from Amazon @ £26 in October 2015). It comes in two versions – half-height for installation in slimline cases and full-height – and is cooled by a passive heatsink, which doesn’t have a fan. This will deliver HD audio to an external device, such as Onkyo 875 home cinema amplifier via an HDMI connection. To use a graphics card instead of onboard video, you should enter the PC’s BIOS/UEFI and disable any setting in it for onboard graphics. If there is no such setting there, disable the onboard display adapter (e.g., AMD 780G) under Display adapters in the Windows Device Manager. The graphics card will be identified by its make/model if its device drivers have been installed, so disable the second entry by right-clicking on it and selecting Disable. Media streamers, also known as streaming multimedia receivers, use an HDMI connection to stream 1080p video to a TV from a desktop or laptop PC or network attached storage (NAS) device acting as a file server. For detailed information on media streamers on this website, visit the article called Media Steamers (also known as Streaming Multimedia Receivers), which covers the specifications, the system requirements for media streaming, file format support and how to set up a UPnP server in Windows Media Player 12 (WMP 12) in Windows 7 and file sharing using an SMB server. That information should be relatively easy to apply to Windows 8/1 & 10. Just as you can buy SATA drive cables that have the connector at a right angle to the cable for easier connections in restricted spaces, you can buy a rotating HDMI cable that can rotate to almost any angle. You can buy them from lindy.co.uk in 1m, 2m, 3m and 5m lengths – part codes: 41515, 41516, 41517 and 41518 respectively. Wireless HDMI kits are available that can be used instead of a long HDMI cable, but there are several competing standards – proprietary Wi-Fi that usually sends video in compressed form within a room, which can produce degraded quality when there is plenty of movement being displayed. – UWB (Ultra Wideband) has a much shorter range than Wi-Fi but a data transfer rate fast enough to provide uncompressed Full HD Blu-ray movies, however, usually requiring uninterrupted line of sight between the sending and receiving devices. Note that some HDMI kits provide an HDMI port on a transmitter and receiver that connect the devices – PC and TV – to expend the range between them or to avoid using an HDMI cable between them. Other HDMI kits just use a USB dongle like most other wireless devices (network, printer, keyboard & mouse dongles, etc. ), which require a computer as the transmitting device. Can a signal produced from a HDMI cable really be transmitted wirelessly and maintain its quality? – Yes, with excellent results. Here is an example kit that has these specifications: Wireless Full HD 1080p transmitter system, up to 1920×1080 screen-resolution support without loss of quality, up to 30m range in rooms and 15m from room to room and 1x HDMI input and 1x HDMI output port on the receiver and transmitter. 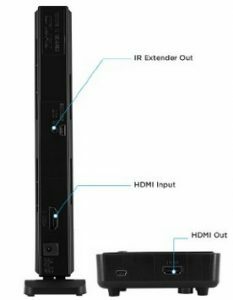 Using it, it is possible to stream SKY HD TV and Playstation 3 signals (additional kit is required for the two additional ports) from, say, a sitting room to a kitchen, with the distance between the transmitter and the receiver being approximately 9/10m. The picture via this equipment displayed on the TV in the kitchen, a 42″ Panasonic L42E30B, is excellent. Web-search for wireless HDMI streamers, which are usually USB dongles. Many LCD monitors now have extra video connections that allow them to be connected to a DVD player, games console or video camera, and some LCD monitors now provide an HDMI high-definition port and support HDCP that allows them to display the latest high-definition movies. HDCP was developed by Intel. It encrypts the signal between the HD video source (the high-definition Blu-ray or HD DVD player/drive) and the display/monitor. Digital output from a Sky HD box, Blu-ray, or HD DVD player will not be dsiplayed if the DVI or HDMI input on the monitor isn’t HDCP compatible. Windows Vista/7/8.1/10 also have HDCP support as part of its digital-rights-management (DRM) software. Question: A monitor with an analog or VGA or digital HDMI input port can be connected to the DVI-I port on a graphics card using inexpensive adapters, so why is that not the case with a digital DisplayPort output from a graphics card to an HDMI or DVI port on a monitor? Answer: A DVI-D is a digital-only DVI port, so it can only be connected from a graphics card to a digital HDMI port on a monitor using an adapter cable, but a DVD-I port on a graphics card can carry both an analog VGA and a digital DVI signal so it can be connected to both types of port on a monitor. Don’t buy an adapter that claims to be able to convert a digital DVI-D signal from a computer’s graphics card to an analog VGA input port on a monitor, because that cannot be achieved. The digital DisplayPort standard is not compatible with either the VGA or DVI standards, but you can buy adapter that can connect a DisplayPort output signal from a computer into a monitor’s DVI-D, DVD-I or HDMI inputs. Just make sure that you buy an adapter the supports the correct DVI monitor input. Also note that there is also a second type of DisplayPort called Mini DisplayPort that uses a mini connector. An adapter for the standard type can’t be used with a mini port. Passive DP++ DisplayPort ports can output HDMI and DVI signals, so a “Passive” DisplayPort-to-DVI or a DisplayPort-to-HDMI adapter costing around £10 is required. A standard DisplayPort output port requires an “Active” adapter costing around £25 that actively converts the video signal. Note that both passive and active adapters only support screen resolutions of up to but no higher than 1920×1200. DisplayPort and Mini DisplayPort (from graphics card) to VGA (on monitor) adapters are also available from around £35. To find out if an adapter is available, identify the output port of the graphics card or motherboard (e.g., mini displayport) and then identify the input port on the monitor (e.g., analog VGA) and then search for an adapter by using the output port’s name in the search query first, as in mini displayport to vga adapter. Prices of these adapters can vary quite a bit from supplier to supplier, even within the same supplier for different products, so it pays to search. The delivery costs must be taken into consideration and might only appear at the checkout.